Heat the ghee (2sp) in a pan; fry the grated carrot (2cups) until the raw smell disappears. To this add sugar (1cup) and cook for 5min with continuous stirring and add cardamom powder (1/2sp). Stir this until it become thick or the moisture evaporate. Remove this from the flame and cool it. In a pan heat ghee (1sp), fry the dry fruits (almond, kismis and cashews). 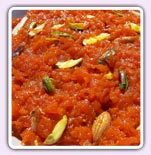 Decorate the halva with dry fruits and keep this in refrigerator for 30min and serve.